With Love Is the Message, celebrated documentary photographer Jamel Shabazz paid tribute to African American veterans and their families against the backdrop of Germantown’s Vernon Park. A US military veteran, the artist served alongside men from Philadelphia when he was stationed in Germany in the 1970s. He had long planned a tribute to their service, resilience, style, and culture. Through collaborations with Friends of Vernon Park, the Aces Museum, the Black Writers Museum, and iMPeRFeCT Gallery, among others, Shabazz’s portraits of veterans and neighborhood residents were featured on a photographic mural near Vernon Park on Germantown Avenue. Additionally, the artist conducted several pop-up photo sessions between Memorial Day and Veterans Day, inviting veterans and others to sit for free printed portraits. A selection of Shabazz’s photographs from the project were displayed at iMPeRFeCT Gallery from September 9 to October 7, 2017. Partners: Mural Arts Philadelphia, City of Philadelphia, Councilwoman Cindy Bass’ Office, Philadelphia Parks & Recreation, Friends of Vernon Park, Historic Germantown, and Germantown United CDC. 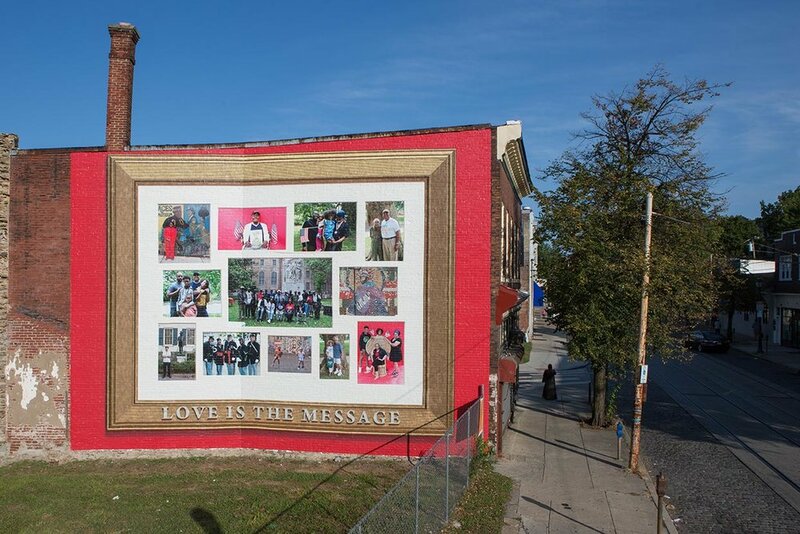 Love Is the Message was presented as a part of the Monument Lab: Philadelphia (2017) exhibition. So much of who I am is a direct result of the music that came out of Philadelphia during the 1970s, under Philadelphia International Records. It was that constant theme of Love Is the Message that really resonated with me and inspired my creative process since first embracing the arts. As a documentary photographer, the camera is the tool that I use to create. My main objective in working on this project was to make intimate portraits of the residents of Germantown, centering on the historic Vernon Park as a natural backdrop. I created images that recognize and celebrate the cross-generational connection, from servicemen and women who made sacrifices for this country since WWII to the present, to ordinary citizens, both young and old, who call Germantown home. It is my hope that this mural will serve as a beacon of light bridging the gap between generations and inspiring a spirit of love and remembrance; for love is needed in the world today, and love is the message I wish to convey. Jamel Shabazz was born in Brooklyn, New York. At the age of fifteen, he picked up his first camera and started to document his peers. Inspired by photographers Leonard Freed, James Van Der Zee, and Gordon Parks, he was marveled with their documentation of the African American community. In 1980, as a concerned photographer with a clear vision he embarked on a mission to extensively document various aspects of life in the United States and abroad. Shabazz says his goal is to contribute to the preservation of world history and culture. In the past 10 years he has had over two dozen solo exhibitions, and his work has been widely collected. Over the years Jamel has volunteered, working with a wide range organizations centered on inspiring young people in the field of photography and social responsibility. Shabazz is the author of 7 monographs.